It’s usual to start having physical pains are you age. The tissues of both supporting and movable parts of the neck are especially common. Changes that occur in both discs and facet joints can lead to osteoarthritis and potentially stir up the pain nerves. Our lower neck is where the most common strains and stresses occur. The joint gets harder to bend and become more prone to injury over time. If you are under a lot of stress, your muscles may begin to tighten which constrain the joints and other pain-sensitive structures close together. This can lead to persistent pain in that area. In addition, the psychological tension that causes the muscles to tighten will magnify pain pathways, further activating deep pain reflexes and could eventually make the situation much worse. Every now and then you may experience this neck pain and probably know ways to cope with it. It could be that you go through the days as usual and let the situation run its course over a few days. If you need quicker relief, here are some definite actions that can be taken. Make sure to consult your doctor before performing tasks towards relieving any type of body pain. A hot compress or water bottle wrapped in a towel applied to the affected area will ease the pain and relax the tight muscles aggravating the problem. A massage with commonly purchased liniments can also heat the tissues and help sore muscles. Neck pains could be caused by bad sleep posture. The pillow should be supporting the neck as much as the head. Avoid sleeping on the stomach with your neck twisted to the side. Many stores carry other neck supporting pillows that will help shape your frame for better sleeping posture as well. Simple pain relievers, taken every four hours, can provide quick relief. If the neck pain and its symptoms are disabling, your doctor can prescribe more powerful medication. Before taking any medication, consult your doctor. Your family doctor may prescribe an anti-inflammatory medication if the neck pain is due to osteoarthritis. These medications are generally effective, long-acting, and free of any significant side-effects. * If the problem is severe or resistant, physical treatment can help. The Physiotherapists will first concentrate on gradual loosening of the tissues with the use of various pieces of equipment, such as an ultrasound or interferential, to place heat deep into the tissues. Gentle hand-directed movement and manipulation of one or more spinal segments can help loosen the tension in the neck from muscle constrictions. 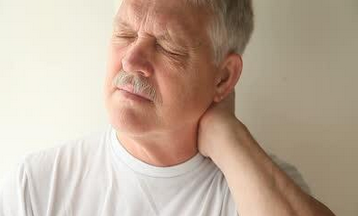 An Osteoarthritic neck must be treated with extreme care. It is far better for the situation to be reviewed by a doctor before you start out on some physical treatment. Exercises focused on stretching and rotating areas in the neck are encouraged. Most of your simple pains can be self-diagnosed and treated. But if they are more severe or last longer than usual, then it’s time to get your family doctor involved. Once the diagnosis is obtained, then the proper treatment plan can begin. Many healthcare professionals are extremely well in dealing with neck issues. Different therapists, even if trained in the same field, will often have an individual approach to an identical problem, but still achieve the same result. A team effort between yourself and a therapist or doctor will help.